This girl gets me. She gets art. She is an artist herself. When I asked this student to be a model for me, she showed up as herself. I was enthralled. Usually it makes someone nervous to pose for me. Not her. She knows herself. She likes oversized sweaters and plays music. When she whipped out her ukulele, I was more than enchanted. 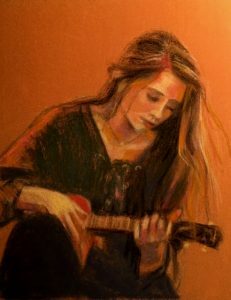 I love painting people, but even more than that, I love painting artistic people playing music. This painting painted itself.